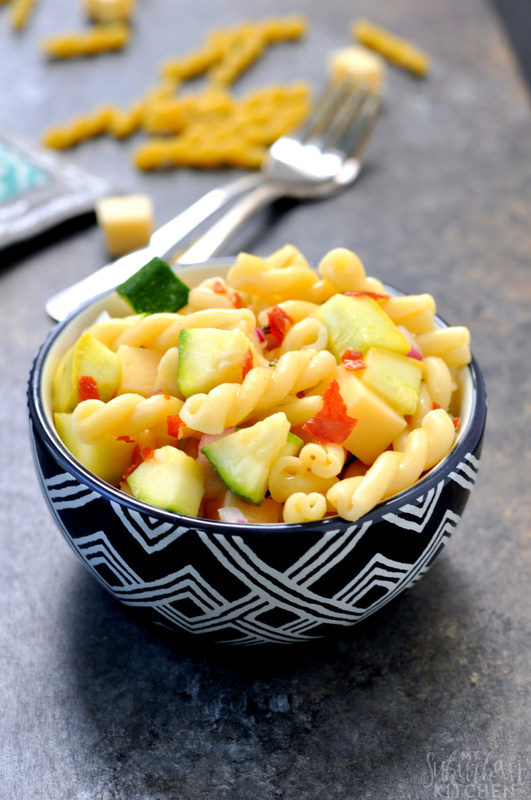 Making Summer Squash Pasta Salad with Prosciutto is a perfect way to enjoy all the delicious zucchini and yellow squash that summer has to offer! 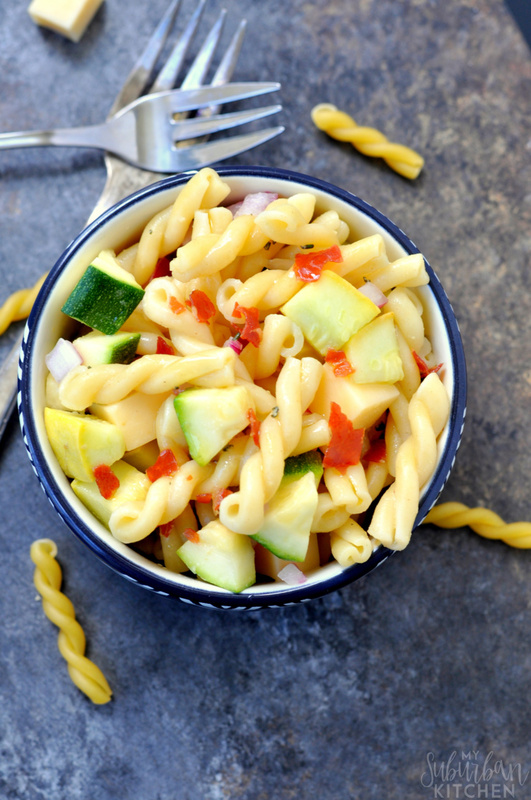 This delicious summer pasta salad is so easy to make and is packed full of fresh, tasty ingredients! Perfect for a picnic, BBQ, or get together with family and friends! Right now is definitely the time to be enjoying summer squash. Our farmer’s market is FULL of it and so is the grocery store. Plus, with it so readily available, the price is great too. In addition to eating it alone, I love using it to create summer squash pasta salad with prosciutto. I love this pasta salad for picnics or any kind of outdoor, summer party. I also make it on Sundays and enjoy it as an easy lunch option throughout the week. It keeps really well in the refrigerator so you can make it ahead of time and enjoy it whenever you want. Preheat oven to 400 degrees. Place prosciutto in a single layer on a baking sheet. Bake in preheated oven for 10 minutes or until crisp. Remove from oven and crumble. Cook the pasta according to the directions on the box subtracting 2 minutes of the cooking time (i.e. if box says 11 minutes, cook it for 9 minutes). With one minute left to go on the pasta cooking time, add squash to the pot. Finish cooking for the final minute. Drain; rinse under cold water to cool. 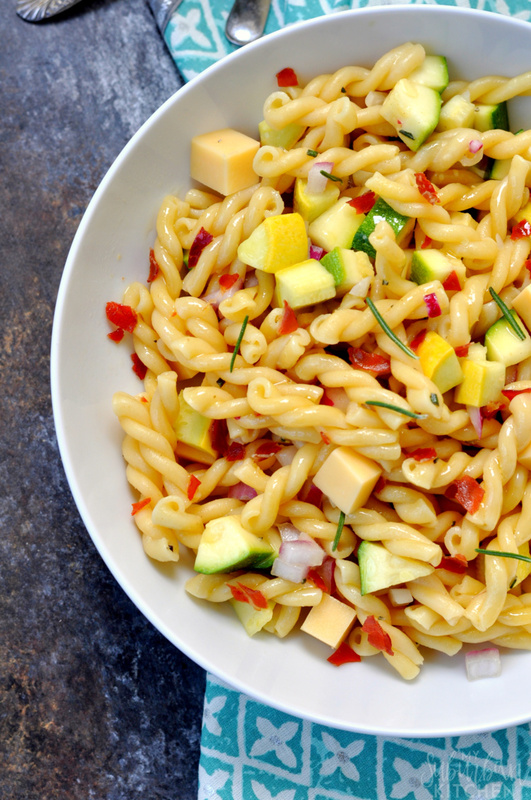 In a large bowl, combine pasta, squash and red onion. Toss to combine. Refrigerate for 10-15 minutes. Add smoked gouda. In a small bowl, whisk together vinegar, olive oil, mustard and rosemary. Add to pasta mixture and toss to combine. Top with crumbled prosciutto just before serving. You can easily substitute crumbled bacon for the prosciutto but, then, I would switch the cheese to a plain gouda so that you don’t have too much smoky flavor going on and over power the dish. I am a huge prosciutto fan so I eat it whenever I can! 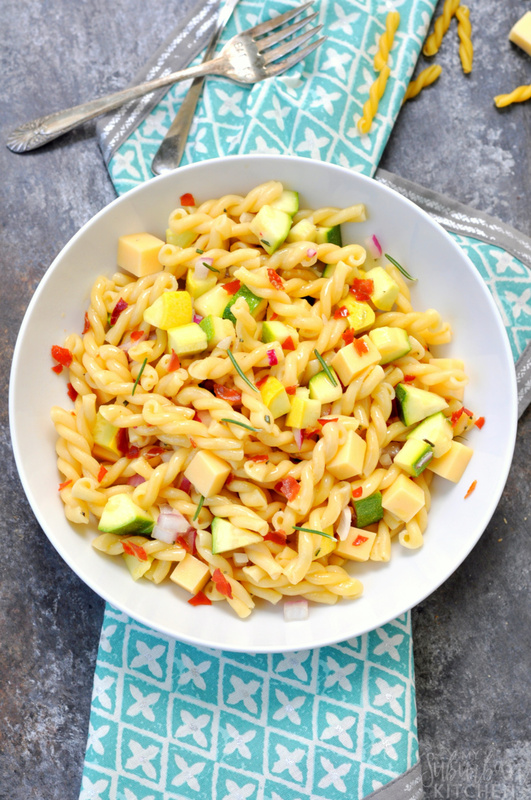 With prosciutto or bacon, this summer squash pasta salad will definitely be a hit any time you serve it! What are your favorite summer dishes to make? Do you love getting fresh summer squash from the market? I love summer squash and this looks so delicious! I’m definitely going to have to try this very soon! Thanks so much for sharing your recipe with us at Share The Wealth Sunday! That looks really good – I love the squash! Thanks for sharing on the What’s for Dinner Linky! This sounds so yummy! I love summer squash. Pinned. I love making pasta salads. This sounds really good. Thanks for sharing your post at the #InspirationSpotlight party. Pinned & shared. Great post. Sounds delicious! Always looking for new pasta salad ideas. Squash is one of my favorites! This looks so delicious and summery:) I have so much squash growing and this inspires me to make a pasta salad! What a lovely salad; the use of squash is unexpected! Thanks for sharing with us on Throwback Thursday! This pasta salad looks delicious! I am going to make it tonight for our family get together, thank you for sharing. How yummy! I love light dishes that I can make in the summer time. Thanks for joining the Family Joy Link Party! This looks great. The rosemary vinaigrette sounds wonderful – I love white balsamic vinegar in a dressing. Pinning!